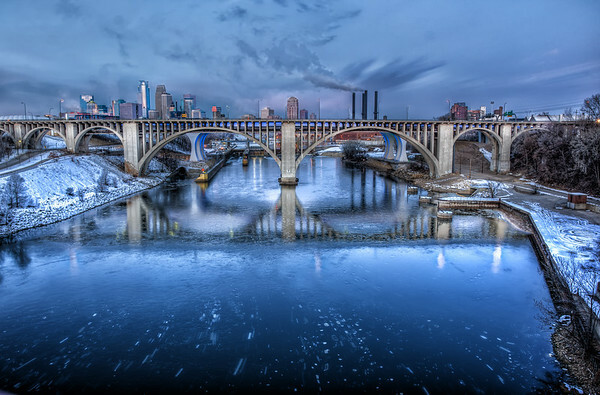 Ice Trails on the Mississippi River next to downtown Minneapolis. Most of the time when processing HDR’s we go to great lengths to avoid ghosting. In this case I embraced the ghosting factor as it added additional ice trails to the river below. I simply chose manual deghosting in Photomatix and processed the 5-shot HDR without selecting anything to deghost. I’m proud to say this received Photo of the Day on Capture Minnesota on February 4th. The HDR category doesn’t get a lot of POTD’s so I’m glad this was well received. To see more of my submissions on Capture Minnesota you can visit my profile. wicked photo! I love it. Cool blue color you got going on there. I really love the variety of tones in this picture! This image is fantastic. I love the cold river. Beautiful. Thanks Cardinal. When I was there I was disappointed the sun didn’t come out (hidden by some large clouds behind me) and thought I missed a good shot. We make the best of the situation and sometimes it works out better than we expect.